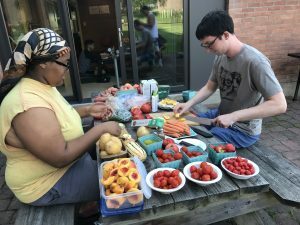 Browse: Home / 2018 / September / 17 / 2nd Street Farms comes to Nason & Vasudha kick off Potluck !! 2nd Street Farms comes to Nason & Vasudha kick off Potluck !! 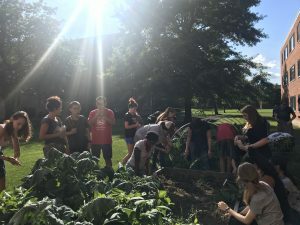 Two Vasudha updates: On 9/14 we had Dara Silberman from 2nd Street Farms come to the Nason Garden and work with Nature/Society students to do some weeding, as well as planting of fall crops! 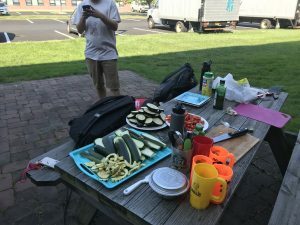 Soon after, on 9/16, we had the Vasudha Potluck where Vasudha students grilled up some veggies bought directly from the Troy farmers market. From the Vasudha garden an impressive amount of kale was harvested! ← Vasudha 2018 – 2019 begins!